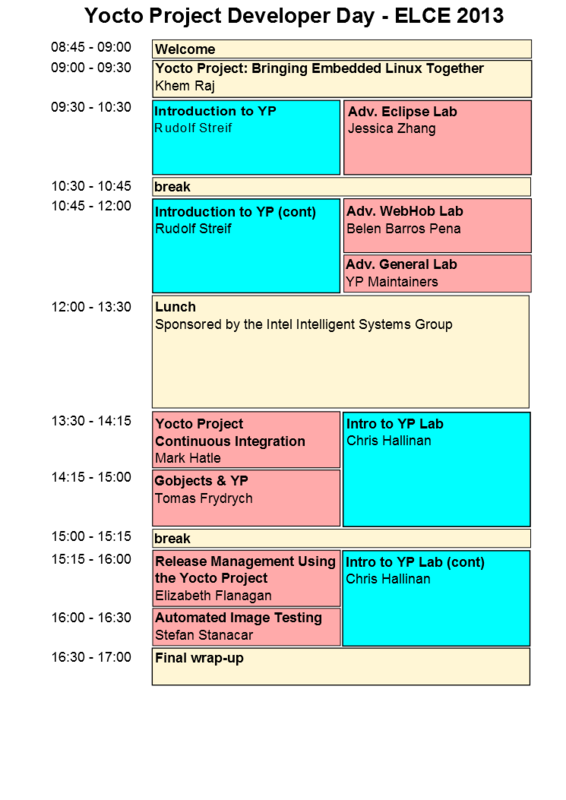 The Yocto Project Developer Day is an all-day event which showcases the Yocto Project and how to use it in practical terms. Two tracks are available, one for those new to the project and one for more experienced users. Each track includes over two hours of presentations and over two hours of hands-on time in our new "lab", a virtual private cloud to which users connect using their own systems - so bring your laptop. This is your chance to meet core Yocto Project developers and maintainers and learn all about the project. This Developer Day takes place on 23 October, 2013, the day before the Embedded Linux Conference Europe, at the Edinburgh International Conference Centre in Edinburgh, Scotland. Developer Day is free to attendees of the Embedded Linux Conference Europe, and only US$199 for those not also attending the conference. Registration is currently open - simply register at the same time you register for ELC-E. If you are not attending ELC-E, please register separately using this link. If you have any trouble or need some answers, please contact Jefro, the community manager. This keynote presentation describes emergent standards in embedded Linux and the ways the Yocto Project has encouraged and created them. This presentation gives a thorough introduction to the project, showing the basic features and philosophy as well as showing how all of the tools work in tandem to create embedded Linux images. This presentation creates a foundation for the lab in the next half of the day. This hands-on lab leads attendees through the creation of embedded images using Yocto Project tools, building on the knowledge learned in the previous presentation. The lab requires attendees to use their own laptops to connect to a local virtual private cloud server using VNC, where they will perform the builds as if they were local and then see the results in an emulated environment using QEMU. This hands-on lab reflects the latest advances in the Yocto Project Eclipse plug-in. WebHob is a new technology being developed by the Yocto Project team for graphically enhanced system development. This lab lets attendees get their hands on the latest version. Have you ever wished you could ask questions of the Yocto Project maintainers in person, with a fresh instance of the Yocto Project software at your fingertips? Well, this is your chance. Bring your questions, concerns, and comments to the virtual private cloud. Several maintainers will be in attendance. How one operating systems vendor uses continuous integration to use the Yocto Project as an upstream to build its own products, and suggestions for others who are planning on doing something similar. GObject introspection (aka GIR) is a technology developed by the Gnome project to facilitate generation of language bindings for its core libraries. This presentation examines the issues that make GIR difficult to deal with in a cross compiling environment and demonstrates how these can not only be solved, but solved in an elegant and scalable manner using the Yocto Project. This talk will focus on the ways to utilize tools within the Yocto Project to help take the pain out of the end user release process. We will discuss different release use cases and different strategies to accomplish artifact releases that are reproducible, tested and adheres to FLOSS license guidelines. We will demonstrate utilizing the new yocto-autobuilder to create tested release artifacts for various use cases as well as the generation of source archives. This talk discusses how the Yocto Project has automated the QA process, along with a demo.